Fast forward to 2013. I just remembered this movie a couple of months ago because we were planning to go on a holiday again and I wondered if this was already released on home video. I searched the net for news about this, and learned that while it was recognized as a breakthough in 2010, it was largely a commercial failure. And at that point, the film was not released in dvd format. I felt it was a lost cause; nonetheless I noted it in my to-do-list. Lo and behold, I saw 2 copies of the movie at a video shop, priced at P399.00! I gleefully grabbed a copy and made a beeline for the cashier. Having watched it with my son a couple of nights ago, I can truly say that this movie is one of the more relevant purchases I made. It is a movie that resonates with my childhood, and at the same time my son was also able to relate to the characters. There were numerous allusions to the typical Filipino way of life: the humble tricycle, the breakfast with plates used as food cover, the very layout of the house of our little hero Nico, kids playing at the internet cafe, the sari-sari store, even the father working abroad. But what really makes this movie nostalgic for me is the segment where the kids played the street games I know so well. My son enjoyed it too because he is becoming a gadget geek of sorts; he'd be in front of the computer all day if we did not check on him. He has also dabbled with role-playing games - particularly Final Fantasy - because I am a big fan too. So he loves the video game element to the movie. And it does help a lot that it has English subtitles! 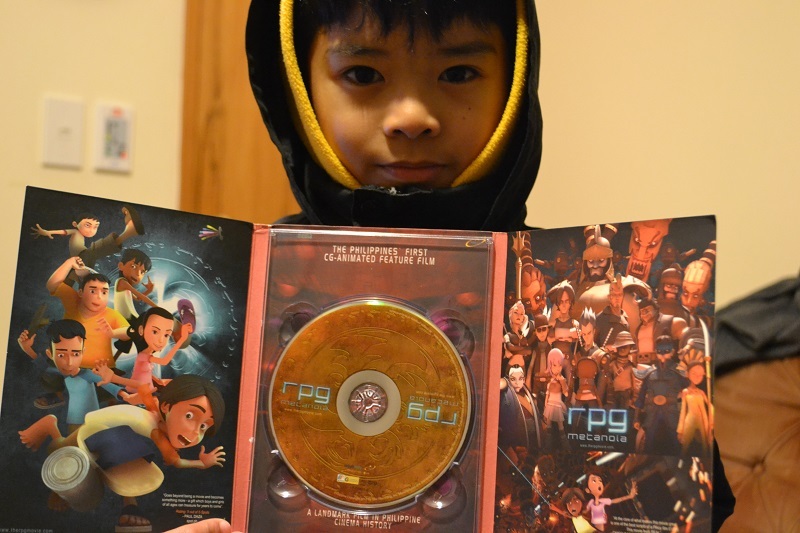 I plan to play the movie occasionally so my son can also get accustomed to listening and understanding the Filipino language (we do talk to him in Filipino, but he automatically responds in English, so we'd like him to be able to speak Filipino as well). It's a feel good movie; I found myself grinning when the movie finished. It's well worth the P399.00 I paid for, and I hope I can buy a couple more when we take a holiday to the Philippines again as gifts!